I went to my first convention ever this year, and it was San Diego Comic Con! It was such an awesome experience that I wanted to share my convention newb thoughts with all of you. So, here’s my story of my first convention ever! Make sure to check out the day one, Game of Bloggers Meetup, day two, day three, and day four reports if you haven’t already! It was the last day, and I wasn’t ready to leave. I’m still not ready to leave, and I’ve been home for almost two weeks as I write this. SDCC was a wonderful experience. It was truly some of the most fun I’ve had in years. I can’t tell you how grateful I am that I was given the opportunity to go (thanks to my friend Kim) and meet all the awesome geeks and nerds who came in droves for the biggest comic convention there is. I woke up a little late on my last day and thought I would have to miss the panels that I wanted to see that morning, but I ended up only being 15 minutes late. There was still a bit of a line for the bus, but it was nothing compared to the day before. Sunday is definitely the light day for SDCC, but it also ends the earliest, so that makes sense. I spent the morning in panels (I wasn’t ready to brave the main floor yet), but I cut my panel viewing short so that I would have a seat for the Buffy sing-along. Apparently, every year there’s a sing-along of the Buffy the Vampire Slayer episode “Once More With Feeling” at SDCC (and at most comic conventions). This is one of the only things about which I said, “I will kill if I have to, as long as I get to do this.” Yeah, huge Buffy fan that I am, I wasn’t missing the sing-along for anything. Case in point: I showed up three hours early. Because of this, I managed to catch a Teen Titans episode followed by an animated Batman feature. Both heavily featured Cyborg, which was awesome. Plus, Batman rode a mecha T-rex with lasers on its back. ‘Nuff said. As the room was clearing out after Batman, I was able to move up to the front center section, find my friends, and get good seats. Yay! 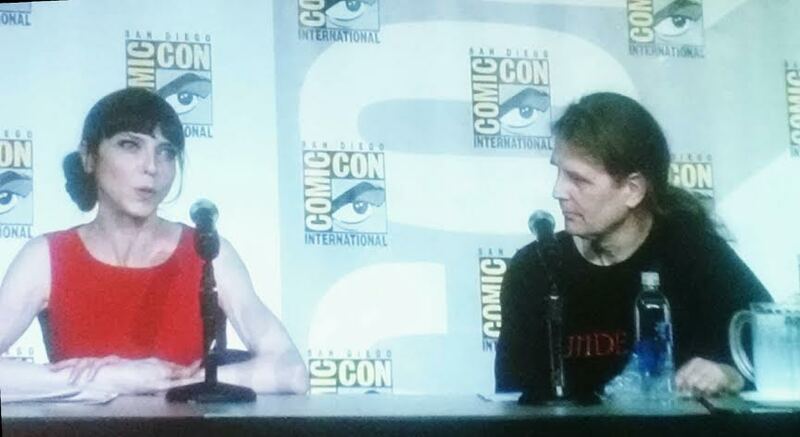 Before the sing-along began, the wonderful Drusilla herself, Juliet Landau, presented a teaser trailer for a film she’s creating about vampires. It looks like it’ll be extremely interesting, featuring actors (like Juliet) who have played vampires as well as the producers of vampire-based material, including Joss Whedon. I recommend seeing this film. Other than being a good film, Juliet was almost killed in a New Orleans graveyard while filming, so people should definitely check out what she almost died to create. There were some technical issues at the start, but we entertained ourselves by quoting the show and looking at the cosplays. There were two cosplays that stood out to me. First, we had a popular cosplay of Buffy at the end of season 1, in her prom dress and leather jacket about to face off against The Master. The second, and quite impressive, was Lorne. It included full green makeup, horns, red eyes, and a shiny suit to rival all shiny suits. Lorne got a standing ovation from many in the room that day. We were also given little mutant monsters to put on our fingers, which I may have used to entertain myself by running my finger around and saying “Grr…argh.” It was a good thing that we had so many things to entertain ourselves with, because we ended up starting the episode more than 30 minutes late. But, the episode eventually started and the room suddenly became a musical extravaganza! I sang every song. So did my friends. We felt no shame. Being able to sing along to one of my favorite musical episodes of all time was truly an experience I won’t forget (and I hear it’s an even bigger event at other cons!). The only negative occurred when the DVD suddenly failed at the beginning of the “Under Your Spell/Standing Reprise.” Luckily, they brought another copy of the episode for just such an instance, but we ended up missing most of the song. It’s one of my favorite songs. It made me sad to miss it, but at least we didn’t have to stop completely. Overall, the sing-along was a great experience that I can’t wait to repeat over and over and over and over…again. After it was over, there were still 45 minutes before SDCC would officially end, so my friends and I decided to brave the main floor. As some readers may remember, I tried braving the floor on a previous day, but was overwhelmed by the crowds. Luckily, on the final day, there are fewer people at cons and, in the last 45 minutes, the crowds dwindle more as everyone prepares to return to the real world. The only thing I wanted to buy the entire time was a LootCrate, my first, but I knew I would never survive the lines any other day of SDCC. I’d managed to scout out the booth’s location during my previous time in the hall, so I was able to head straight for my goal. 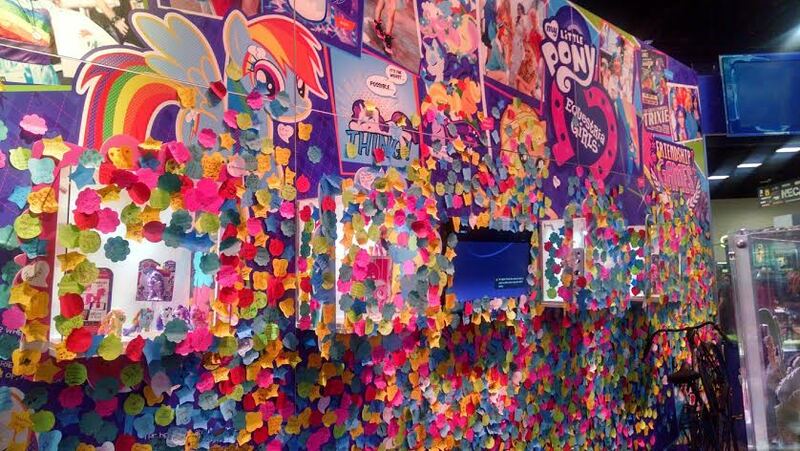 I did stop briefly on my way to the booth because of this amazing My Little Pony display, with notes from people about friendship. I also ran into Chris Bramante, of Animfantastic, Robot Teammate and the Accidental Party, and the Sunnydale Study Group podcast. As I’d just been a guest on an episode of the podcast, we briefly talked before parting ways (turned out, we were both at the sing-along). I made it to the booth with 30 minutes to spare, irritated the woman working there because I didn’t understand some of her questions in my sleep-deprived mind (sorry about that), and claimed a creature-themed box for my own. I made it back to my friends, who had gone down Artist Alley, and we exited the last day of SDCC five minutes before the convention center closed its doors. We headed to a Thai food restaurant to celebrate the end of the adventure and to spend a few last moments together before we all headed off to the different parts of the U.S. that we call home. After dinner, we decided to head to the Geek Chic lounge to really end our trip…until I realized it was five minutes until the last shuttle left and had to leave to try and catch it. I was not successful. Instead, I took the light rail back to my hotel (thank you, public transit) and spent the rest of my night with my roommate as we worked on repacking all of our stuff and finding room for our new swag in our suitcases. At this point, I actually bought my train ticket back to LA so I wouldn’t be stranded in San Diego, even though I wish SDCC could have gone on forever. It was a good trip that I won’t soon forget. All was well.